Oatmeal, oatmeal, oatmeal. Obviously I’m a HUGE oatmeal fan, but we need to have a little chat. Do you ever eat oatmeal for breakfast and then are starving two hours later? That is what we need to chat about. Oatmeal on it’s own doesn’t have much protein in it and unless you’re making it with milk instead of water, not much fat either. 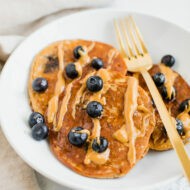 So you’re essentially eating a bowl of carbohydrates. I’m not knocking carbs at all (I love carbs! ), but what I am knocking is not eating a balanced meal that will keep you feeling full for hours. The perfect formula? Healthy fats, carbohydrates and lean protein. 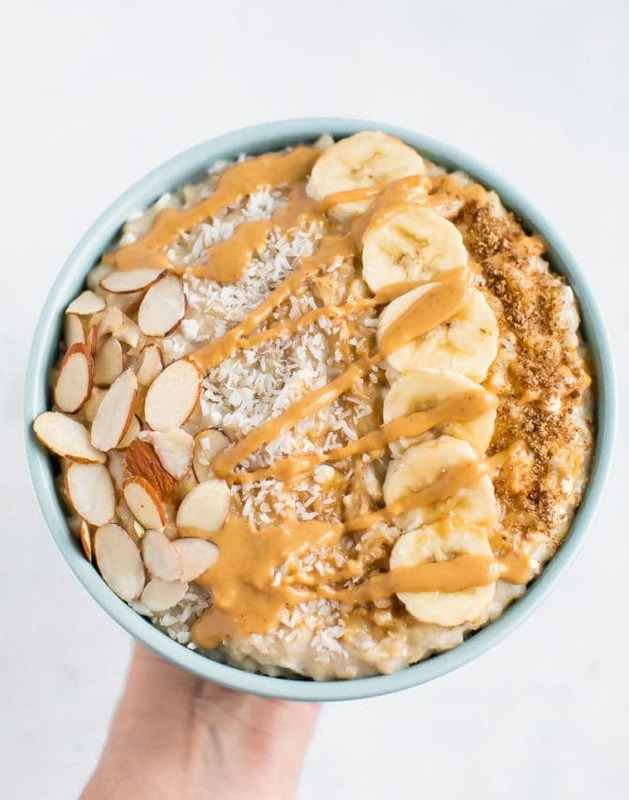 How to Make High Protein Oatmeal? 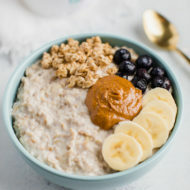 There are a few different ways that I like to add protein to oatmeal and I’m working on a full blog post covering all of them, but for today’s recipe we’re focusing on cottage cheese! 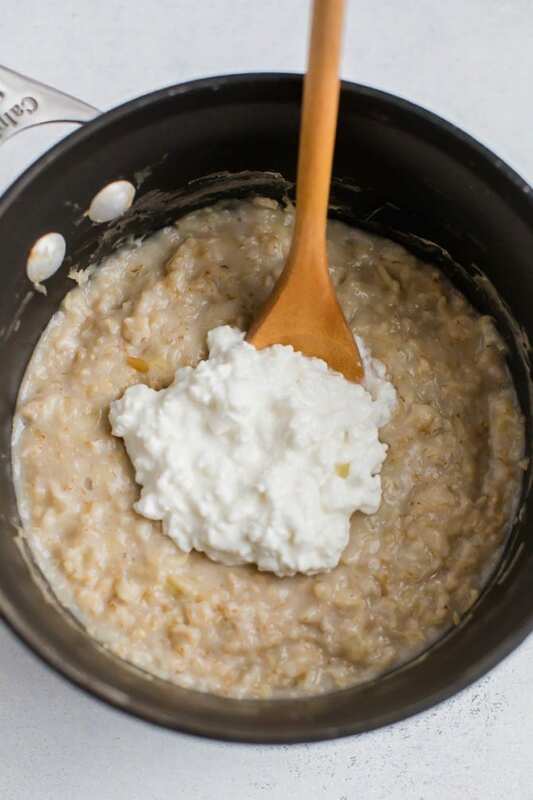 Adding cottage cheese to your morning oats is so easy! 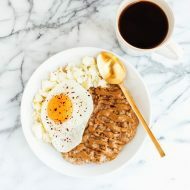 You can cook your oatmeal however you would like (stovetop or microwave) and then simply stir in cottage cheese after cooking! For this particular recipe, I made my base stovetop oatmeal recipe with rolled oats, banana, sea salt and water. Heat over medium-high heat until liquid has been absorbed and the texture is the way you like your oats. 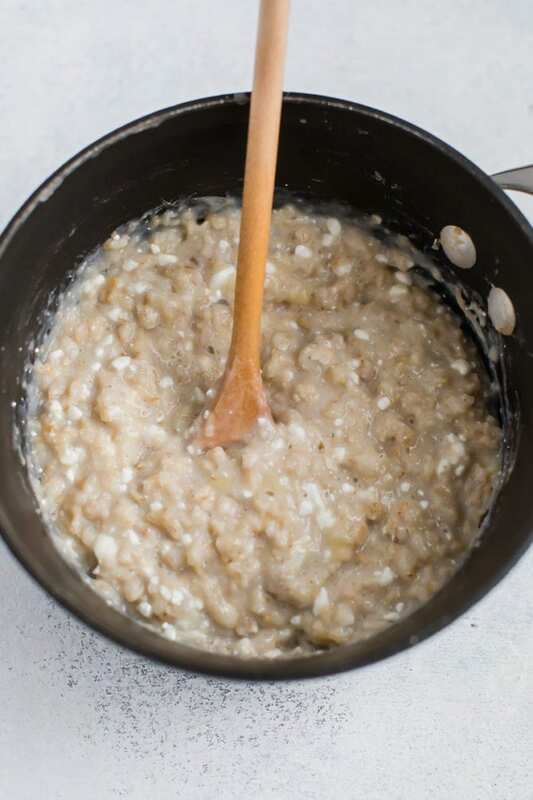 Remove the oatmeal from the heat and stir in the cottage cheese. Start with just a 1/4 cup and add more if you’d like. 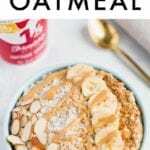 It does slightly change the flavor, but it also makes the oatmeal extra creamy. I love it! One tip: don’t add the cottage cheese before cooking your oats. The consistency gets weird! It’s much better stirred in after the oats have cooked. What Type of Cottage Cheese to Use? The type of cottage cheese you use is up to personal preference. I personally like to use organic dairy products free from antibiotics and hormones (like rbST). If you’re looking for good organic cottage cheese brands I recommend Organic Valley and Nancy’s. I also like Friendship Diaries no salt added, small curd 1% cottage cheese (in the red container). Cottage cheese tends to be really high in sodium so I like that this variety is a little lower than your typical brands. Unfortunately, this brand isn’t organic. 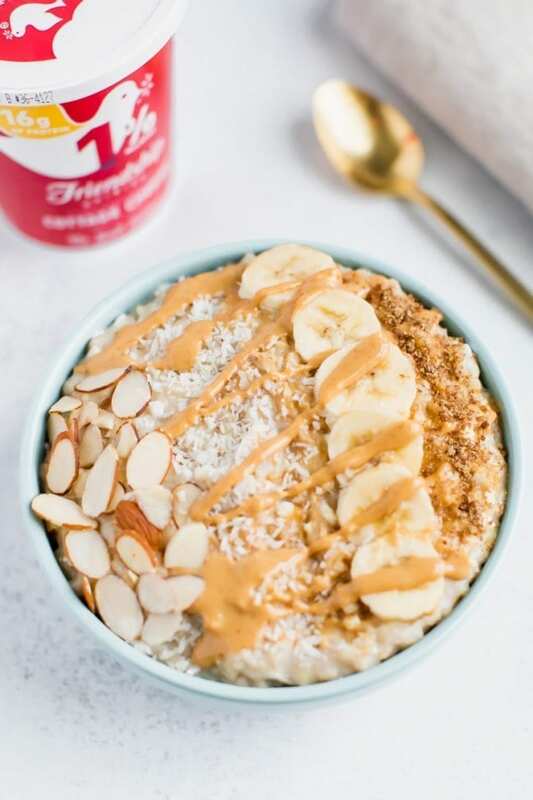 Once you’ve added the cottage cheese to your oatmeal, simply finish things off by transferring the oats to a bowl and add your favorite toppings. This is where you’ll want to think about adding those healthy fats in. 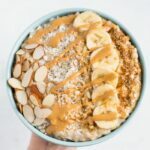 For this bowl I used a drizzle of peanut butter, flaxseed, sliced almonds and coconut flakes to add those healthy fats! 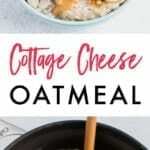 If you make this cottage cheese oatmeal, please be sure to leave a comment and star rating below letting me know how it turns out. Your feedback is so helpful for the EBF team and other EBF readers. Have you ever tried Good Culture cottage cheese? It’s amazing… I crave it. I’m not a fan of cottage cheese. I add walnuts to my oatmeal for extra protein and I like the crunch.